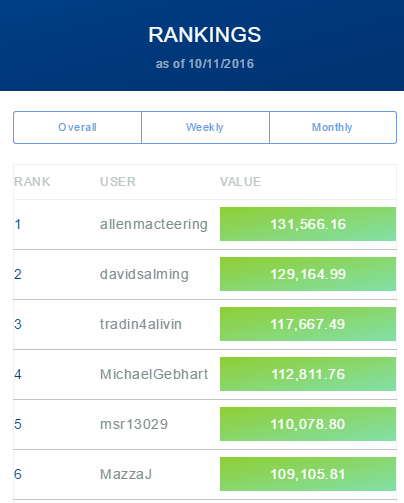 Frustrated with the delay between the updates in your portfolio value, and how fast you move on the rankings page? In the past, we needed to check everyone’s account and revalue them in a loop to update the rankings page – a process that could take up to 2 hours! We sped this up a few months ago by only showing people who have placed at least 1 trade, but get ready for true high-speed competition! The value showing on the rankings page now updates every time you place a trade, and your position with it. This means every buy, sell, short and cover can move you up or down in real time. Users who don’t log in or trade are still updated every hour. This also means we are now including every participant in every contest in every ranking – a feature teachers have been dying for, so now it only takes a second to see who is – and who is not – correctly registered in your contests.